Spectrum Industries has introduced a two-in-one Flex Lectern that combines an instructor workstation with a mobile device cart. The new product line comes in two models: the Pro32 Flex Lectern, which can store and charge 32 laptops, Chromebooks or tablets up to 15.6 inches, and the Cloud40 Flex Lectern, which can store and charge 40 Chromebooks or tablets up to 14 inches. Each Flex Lectern features a high-pressure laminate worksurface, worksurface surround (for instructor privacy) and flip-up side shelf. An overhead cord management system keeps charge cords organized above each mobile device storage bay. A standard current-sensing charging system directs power to devices as needed. Heavy-gauge steel doors, dual-bolt keyed lock and hasps provide security. 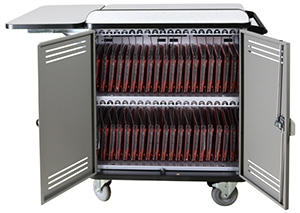 "The Flex Lectern will eliminate the need for both a teacher lectern and mobile device cart to exist in the same environment, saving on valuable space in classrooms that are often crowded with furniture," said Robert Kensinger, vice president of sales for Spectrum Industries, in a statement. For more information, visit the Spectrum Industries site.